It’s day 24 and we have a winner of the ProCompression socks ~ Sarah Wells! You should have an email from me. Yesterday was What I Ate (and did) Wednesday. Didn’t do it last week, had too much going on. For breakfast I had a protein shake, added immune boost, apparently I need it. What to know what I did? I worked and I coughed all day long. I have never been this sick that I can recall and I’m ready for the germs to be gone! 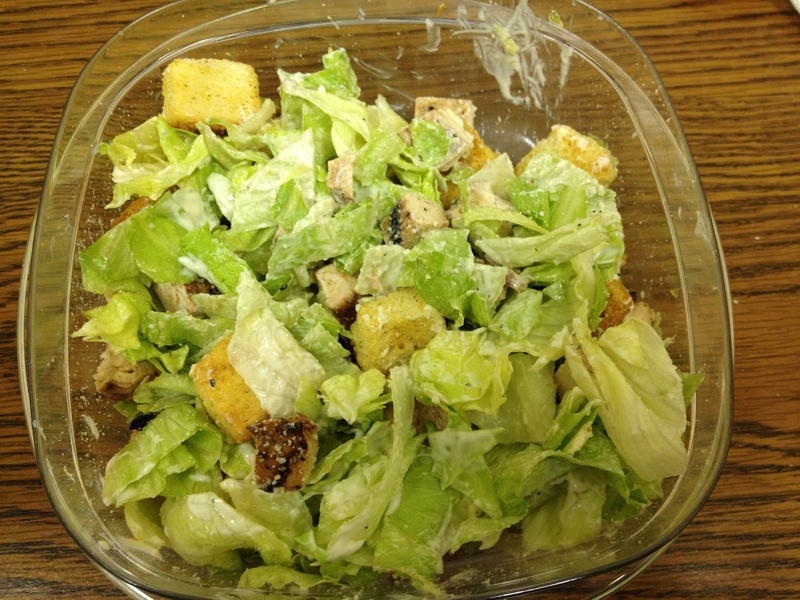 I had a homemade caesar salad for lunch with grilled chicken. 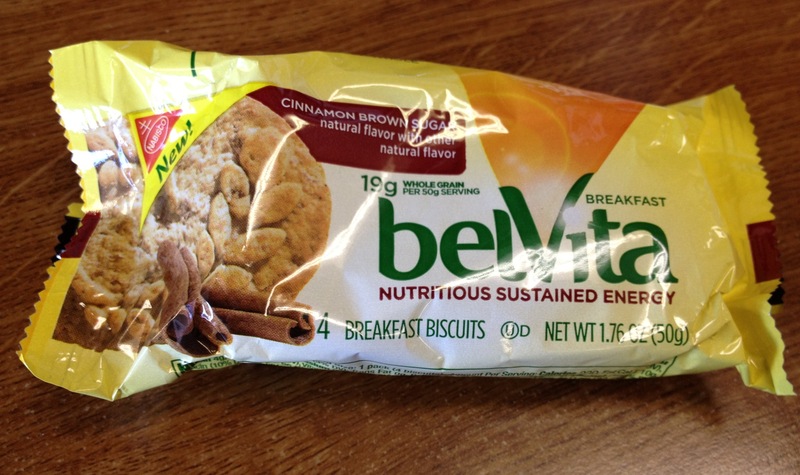 Has anyone tried these BelVita breakfast biscuits? They aren’t biscuits so that’s kinda misleading, but they are pretty good. I bought them at Costco Saturday after sampling them. They made a pretty good morning snack today. Loaded with good for you stuff! And since I worked late, and it was basically leftovers for dinner I had chicken and rice. I probably did not eat enough calories today but I just wasn’t feeling it. I also went to the doctor for my follow up about my foot, and I got released to run! So, now I just have to kick this cough again and I’ll be good to go! Cowtown is in exactly 30 days!! Don’t forget the giveaways this week end tomorrow at 11:59PM CST. We have Nuun Hydration tablets and an entry into a Muddy Buddy race! What’s on your agenda for today? This entry was posted in Uncategorized and tagged #30dayhomies, Belvita, cowtown, how my world runs, procompression, running. Bookmark the permalink. Yesterday – shake for breakfast, lunch was homemade chicken salad on romaine lettuce leaves and 15 min on treadmill and 100 steps on airclimber. Awesome job Marie! I’m liking these Belvita snacks. I had a banana for Breakfast, grilled chicken and grilled veggies for lunch (at satlgrass but I skipped the bread and salad! Super tough) And I had a very lowfat homemade chicken spaghetti for dinner. But then had a scoop of ice cream later :o( Only got in half my workout because I wasn’t feeling well either. Hope you are better!!! So I have a question for anyone out there…. I am on week 3 of my new running program and loving it but I am finding it harder and harder on my knees. Today I am in alot of pain and really wanting to run this afternoon after work but I am just worried that I am doing something terrible to my knees. I have the Legoland run with my daughter (who is super excited) on Saturday and I don’t want to be in so much pain that I can run. Any helpful tips??? Thank you! Alma, are you running and walking or just running? You should be walking some at first. Also, an ice pack should help. If you are in enough pain that you don’t want to run you should go to the doctor. You might try stretching really good too, your hamstrings and calves can affect how your knee feels.